Friands, friands, friands. I'm never sure what I think about you, sure you're simple to make but you demand expensive ingredients such as almond meal and berries. Yes, you're a good way to use up excess egg whites but are you really worth it? Apparently my friends think you are, I still remain unsure. Friands are an Australian and New Zealand treat, but like most things they're an adaptation of something else. Apparently they're based off financier; my source for this information is, naturally, wikipedia. Any information beyond this little snippet of trivia is hard to find. In Australia you can buy tins specificity for making friands, they're typically oval shaped. However, it's not the shape that makes a friand a friand, it's the ingredients. Friands come in many shapes and sizes - why the oval shape has become associated with the friand I have no idea. I personally prefer to bake mine in cute paper cases because they're so easy to clean up when you've finished as there's no tray, except for a flat baking tray, to wash up. I think these friands could use the addition of coconut, however everyone I mentioned this idea to shook their heads at me and said "no!" rather loudly. Next time I'll make them with coconut and we'll see how everyone reacts. Preheat oven to 180°C (350°F), place paper baking cups on a flat tray. Melt butter in a small saucepan over low heat. Cook the butter until it is light golden in colour, remove from heat and set aside. Combine the almond meal, icing sugar, flour, baking powder, and lemon zest in a medium bowl and whisk to combine. Stir in the egg whites and mix until well combined. Pour in the butter and stir until completely combined. Spoon batter into paper baking cups, filling each cup just over 3/4 full. 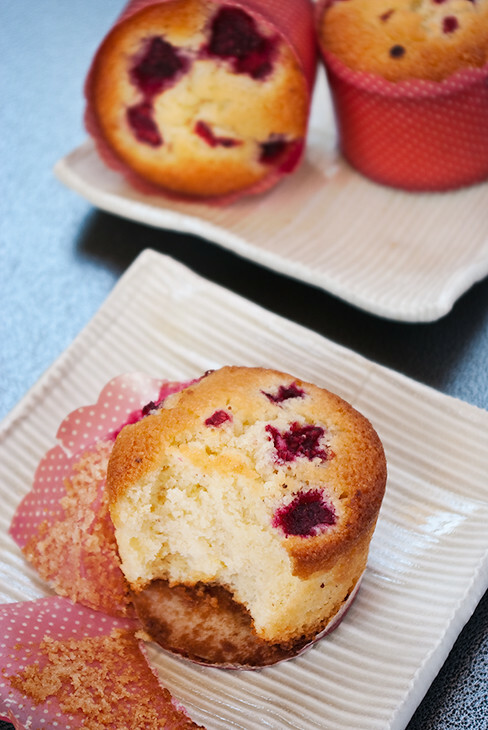 Scatter a few berries on top of each friand, resist pushing them into the batter. Bake friands for 15-20 minutes, or until they are golden on top. Cool on a wire rack. These are good looking friands. They look light and fluffy. I often find that friands from a cafe are oily as the butter seems to come out of solution. These seem to be good. I have never made friands, but they look so nice I am going to have a go. If they turn out as nice as Daniel's Apple and Pear Cake that you did, I will be on to a winner. I made mine the night before and it just disappeared. Thank you so much for your recipe. Can you tell me where you got the spotted cake wrappers from - I can only seem to find boring white ones or brown - they seem lots of fun. Keep doing the good work - and encouraging me to bake!! 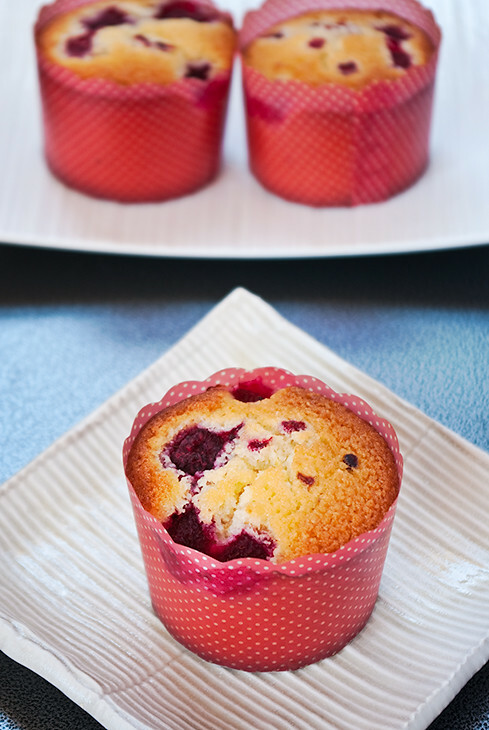 Gorgeous friands Taranii and the perfect solution to the bowl of egg whites in my fridge :) I love your blog!! I love using up egg whites in this oh-so productive way. I am going to put this recipe in my "recipes to create" pile!! Mark: I agree, maybe it has something to do with the age of them? Patricia: When I first found your blog I assumed you were from Oceania because of all the friands you make! They always look so delicious. Anne: The paper cases are from Robert Gordon, I'm not sure if you can buy them outside of Australia but I would assume you can find something similar somewhere. Asha: Thank you so much! I hope yours go well! Susan: I do to, I feel sad if they go to waste. I hope, if you get around to making them, that your friands taste great. Heya! I tried the recipe and these were so so so good. Thanks! Love your pics by the way. Melissa: I'm so glad you hear they worked! Yay! Made these today, very very easy & yummy, and they worked well enough with tinned raspberries. Thanks for sharing!